DDA builds Interactive Benefits Guide to help American College of Physicians recruit and retain members. With more than 132,000 members, the American College of Physicians (ACP) is the largest medical specialty organization in the United States. To recruit new members, ACP needed to update their welcoming kit. To retain current members, ACP needed to remind them of everything ACP has to offer. To maximize the budget, ACP needed a two-fold marketing approach that would help new and existing members understand the value of the organization and what is available in order to increase member participation and retention. Presentation was a key factor for ACP. They wanted a member benefits tool that would be easy to understand, user-friendly, and engaging. The tool was to be based on a task-oriented format that covered the full spectrum of ACP’s benefits, products, and services. As tasks were to be loosely based on the structure of ACP’s website, ACP requested that direct links to ACP’s website be made available for users should they want to learn more about a given topic. and user controls to open and close video or text, so that users can glean information in a way that suits them best. After reviewing the SmartSite™ technology, ACP immediately understood its value and realized its relevant application to serve their marketing needs. The objective then became to create a custom SmartSite™ for ACP, one that would provide users with complete control over the information they want to view and how they want to view it. After ACP selected three actors from the DDA’s Actors’ Network, DDA filmed each one on green screen in our state-of-the-art video production studios. DDA embedded the videos produced within the framework of task-oriented modules designed by DDA to encourage user-friendly and intuitive navigation. Synchronized text and images create a compelling, visually interacting, and immersive user experience in this web-based tool. 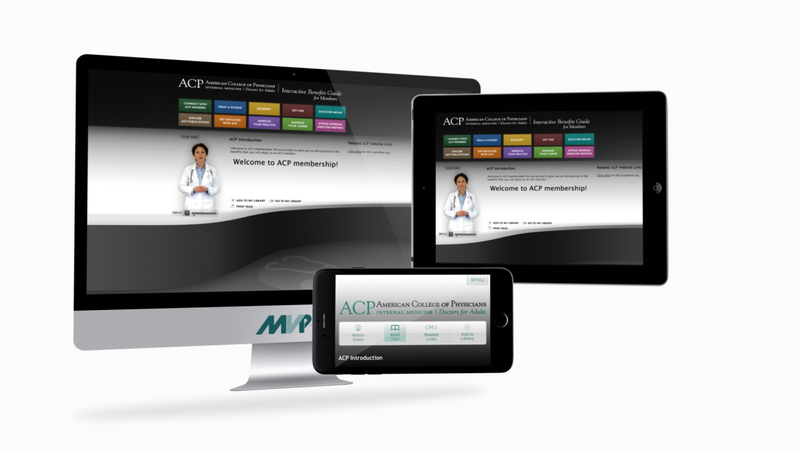 Each and every benefit ACP has to offer is organized in an engaging platform that makes it easy for users to navigate to particular items of interest and obtain information exactly the way they want to. In order to provide ACP with separate metrics on new and current members visiting the tool, DDA programmed a tracking capability for two distinct branding URLs. To reach members on the go, DDA programmed the entire tool as a mobile version that is compatible with iPhones®, iPads®, and Android™-powered devices. Beyond a welcoming kit for new members, the interactive member’s guide is used by ACP for recruitment and retention purposes. This wholly engaging marketing and presentation device successfully welcomes new members to explore the many benefits that are now available to them and re-engages older members who may be looking to see what they can get with their ACP membership. In fact, the tool has exceeded ACP’s expectations in driving membership so much so that the organization is considering similar interactive approaches to increase recruitment rates specifically among a younger demographic of medical students and residents.